The region between the main road and the sea has also been subject to extensive quarrying as well as slippage which has tilted huge masses of rocks at crazy angles. 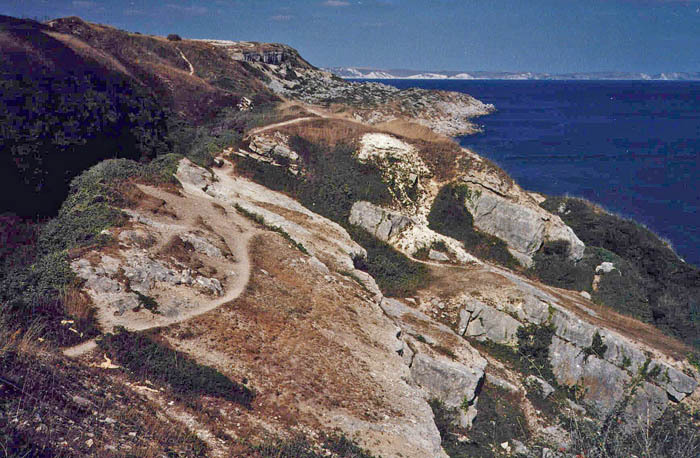 This is an interesting part of the coastline to explore and can be reached by following a well-trodden footpath leading south from Church Ope Cove. Please click here for a detailed map. Click the BACK button on your browser to return to this page. 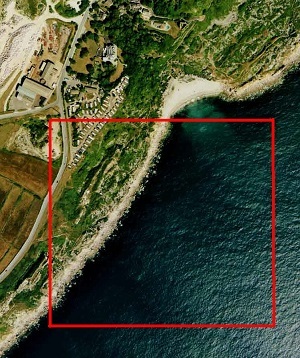 Please click here to visit the satellite image of this area on Google Maps. Click the BACK button on your browser to return to this page. Please click here to visit the street view image of this area on Google Maps. Click the BACK button on your browser to return to this page. Please click here to visit a detailed map from about a century ago. Click the BACK button on your browser to return to this page. Click the BACK button on your browser to return to this page. Please click here for an excellent article about the Southwell Landslip. Above and below we see typical scenes along the Southwell Landslip pictured in 1990. Huge blocks of stone have slid and tilted over making this a fascinating landscape to explore with caution. On the left is a deep gully which is impenetrably filled with bushes and brambles. I explored this large hole by throwing stones into it. Many returned a metallic 'clang' which suggested that plenty of Portlander's cars have been sent to their grave in this hole. 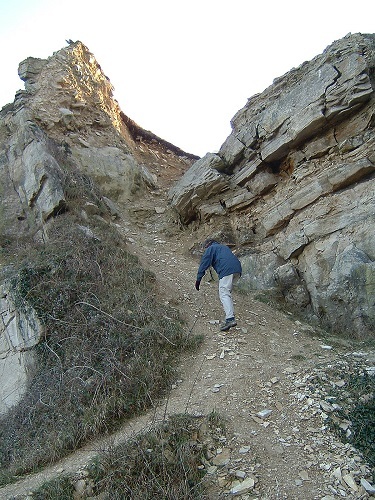 The landslip area can either be accessed from Church Ope Cove by climbing this steep and difficult path or by an easier path from the Cheyne car parking area. It was from this part of the coastline that much of Portland's raw sewerage poured into the sea. 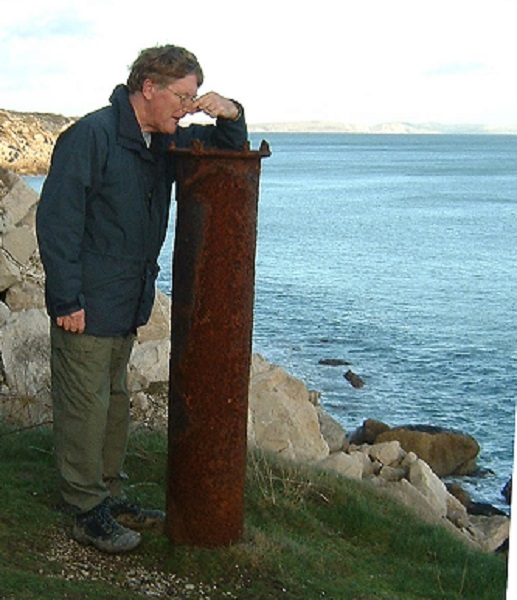 I recall in the early 1970s sitting close by the end of the sewer pipe and watching all manner of disgusting things dropping into the sea - the pipe did not even discharge below the low tide water line. 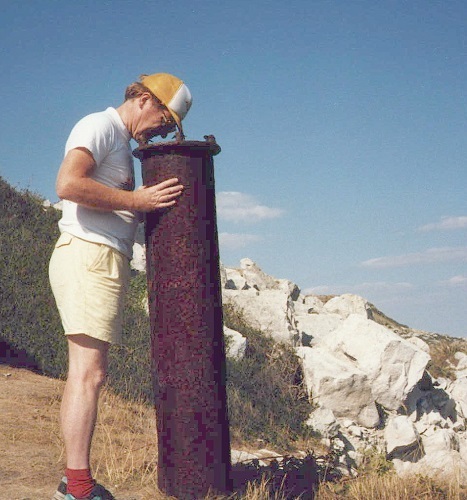 The sewerage was carried in a pipe from the main road down to the sea in an exposed rusty pipe. Above I was exploring a vent pipe on the old sewer system in 1990 and, below, just checking again in 2004. 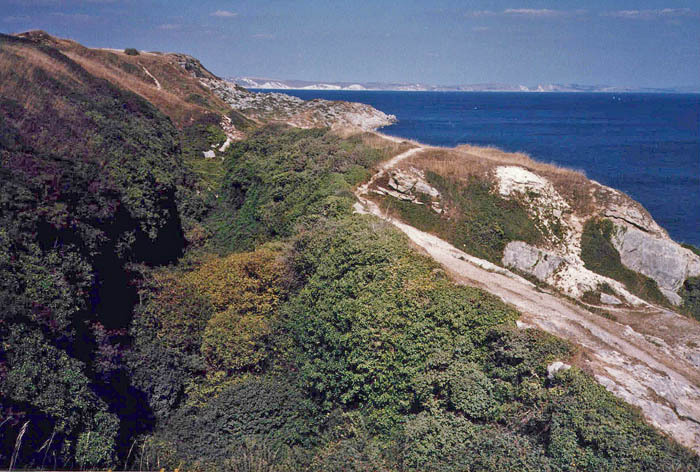 In the 1990s a huge and expensive scheme was completed which involved taking all Portland's sewerage and pumping it to Weymouth. Many Portlanders considered this an excellent idea in view of the centuries old dislike that Portlanders have felt for Weymouthians!